We are in the same family tree. We married the same woman. My 10th. great grandfather married Tom’s 10th. great grandmother – twice! We are kin to Shakespeare. Here is the apartment my ex lived in with Thomas Pynchon. It has “ECLIPSE” written all over it! Don’t you think he is keen on the Buck Hangars and this Nazi talk? Mary Ann Tharaldsen was Christine Rosamond’s sister-in-law. She got Tom a job at Boeing. I bet your Bob Buck makes Pynchon – even more paranoiac! There’s “DOOMSDAY” written all over Bob. “Engineering physics, the hardest program at Cornell, was meant to supply Cold War America with its elites—the best and the brightest, junior league. One professor called its students “intellectual supermen”; Pynchon’s old friend David ­Shetzline remembers them as “the slide-rule boys.” But after less than two years in the major, Pynchon left Cornell in order to enlist in another Cold War operation, the Navy. He once wrote that ­calculus was “the only class I ever failed,” but he’s always used self-deprecation to deflect inquiries, and professors ­remembered universally good grades. Tharaldsen says she saw Pynchon’s IQ score, somewhere in the 190s. So why would he leave? He wrote much later about feeling in college “a sense of that other world humming out there”—a sense that would surely nag him from one city to another for the rest of his life. He was also in thrall to Thomas Wolfe and Lord Byron. Most likely he wanted to follow their examples, to experience adventure at ground level and not from the command centers. 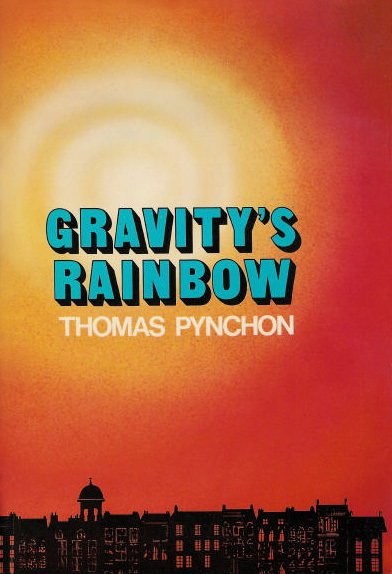 I have not read Thomas Pynchon’s Gravities Rainbow. I tried, and put it down, along with ‘V’. My former wife, Mary Ann Tharaldsen, lived with Thomas in Mexico for three years, and was his lover. They met at Cornell. Mary Ann showed me the words Thomas wrote her inside her copy of V. There might be some jealousy here, but, I don’t get it, why his books got all this/that attention, and why some say it is one of the greatest American novels ever written. I’m sorry – and I have just read the treatment by Wikipedia. However, I am intrigued with it’s connection to Rena and her husband, Sir Ian Easton, who got his compatriots at British Aeorspace to put up money to put the ‘White Crusader’ in a cup race. Rena and Ian are Pynchonish. This literary theme I have woven around them takes on a life of its own. Pynchon takes us back to 1945 a period where Ian Easton excelled as a pilot and hero. This is Ian’s era. He marries a young woman who is not even of my era. Rena is what comes after the Hippie-Peace era – that Thomas appears not to have been a part of. Pynchon seems to have created his own fictional peer group, slipped in a generation – that did not exist – but for the woman I married around the same time Ian and Rena got married, 1979. Mary Ann is ten years my senior. Like Pynchon, Rena dropped out of sight – and is ungrouped – till now! Putting Rena and Thomas together, reading a book, or, taking a road-reading trip, is no a fantastic stretch of the imagination. Did Thomas employ Mary Ann as a character in his books? Yes. Again we have a classic study of Life imitating art in a weird way, because Thomas may have been keenly aware of this theory, and creates a Life and Art World where he is the only living thing left standing. Rena and Thomas may have painted themselves into a corner. This may be applicable to my former wife, who is reclusive, now. Are these people just hanging around waiting to be plucked and thrown into the workings of a novelist – who gets the last word? I have looked at the idea that Ian Easton is the real James Bond, and thus he wanted the most beautiful woman by his side. Rena is – Bondish! To read this entry about British Aerospace is the read what Pynchon mimicked, even channeled in some manner. Rena must have been surrounded by military eggheads who fought a cold war in her home – around the clock! Dinner at the Eastons must have been like dining in a war room. Rena must have been very impressed as she stood guard as a life-size statue – against the flowery wallpaper.